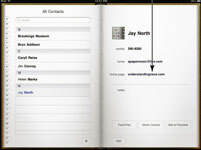 iPad helps you track important contact info such as addresses, phone numbers, websites, and so on. 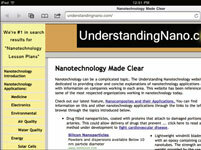 If a contact has a blog or other website for example, you can load it up in a jiffy on your iPad. If you entered website information in the Home Page field, it automatically becomes a link in the contact’s record. You’ll use this link to bring up the associated webpage. 1Tap the Contacts app icon on the Home screen. 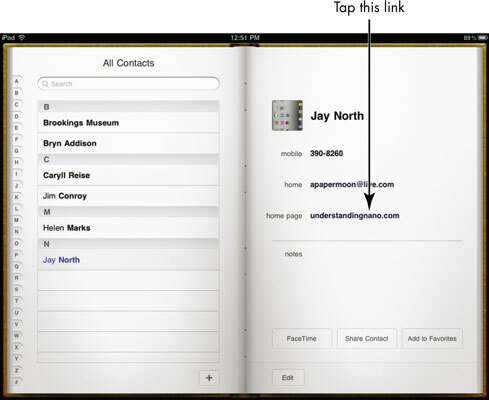 The Contacts app is opened, and a list of contacts appears on the left. 2Tap on a contact’s name. The person’s contact information is displayed on the right-hand page. 3Tap the link in the Home Page field. 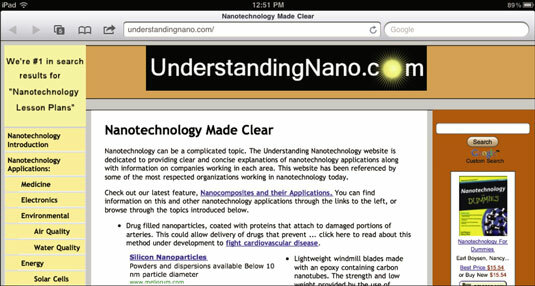 The Safari browser opens on your iPad with the web page displayed. You cannot go directly back to Contacts after you follow a link to a website. If you want to return to Contacts to look at more information or to visit a different contact’s website, you have to tap the Home button and then tap the Contacts app icon again to re-enter the application. You can also use the multitasking feature by double-tapping the Home button and choosing Contacts from the icons that appear along the bottom of the screen.